It eases the rules governing transnational companies (Halliburton and Chevron, for example) and serves their interests at the expense of Jo Citizen. It involves 12 nations, including Australia, and has been underway since 2010, almost entirely in secret. The secrecy and media blackout alone raise serious alarm bells. It affects daily life in relation to the internet, movies, pharmaceuticals, the environment, and democracy, and therefore cannot be dismissed as irrelevant, or ‘just about trade’. It involves different rules for transnational and domestic companies, and capacity to order “unlimited payments of tax dollars to foreign corporations.” Investor-state dispute settlement (ISDS) grants investors the right to use dispute settlement proceedings against foreign governments. It favors financial deregulation, despite the lessons of the last financial crisis. The negotiating table does not embrace consumers, libraries, students, advocacy groups or other users of intellectual property; internet service providers and generic drug manufacturers (as distinct from Big Pharma) are also poorly represented. 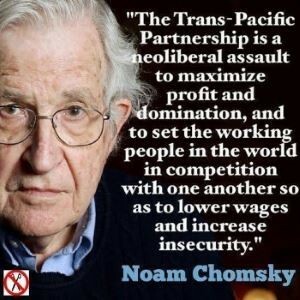 Click here for a Facebook group in Australia opposing the TPP…Joan Beckwith. This post on the TPP first appeared on the 2020socialjustice Facebook page; embedding that post here to preserve comments…Joan Beckwith.